IT’S ONLY 9 A.M. BUT THE Montana Raptor Conservation Center, located just north of Bozeman, Montana, is squawking with activity. A late April storm has unleashed a foot of snow, adding a layer of complexity to Becky Kean’s already busy day. All told it will take five people, three cars and 12 hours of driving to get this precious cargo to the center’s intensive care unit. It’s all part of a human network the center has built over the years, with help from hundreds of volunteers and myriad organizations including the Audubon Society, Charles M. Russell National Wildlife Refuge, Fish and Wildlife, Montana Fish, Wildlife and Parks, and many others across the state. 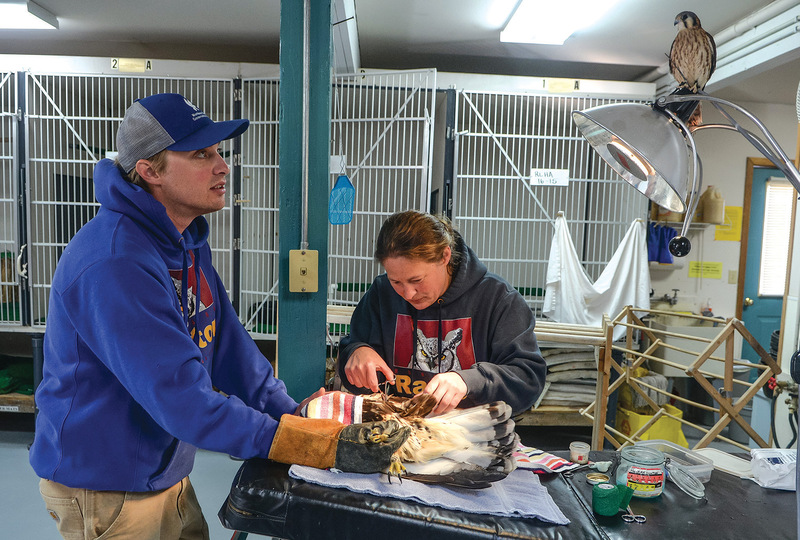 This small owl is one of more than 3,000 birds, representing 31 species of raptors commonly observed in Montana, that the nonprofit organization will have rehabilitated and released since its inception in the late 1980s. All of this has been achieved through donations, grants, license plate sales and countless volunteer hours — including donated surgical care from Bozeman’s All West Veterinary Hospital. Raptors have sharply curved beaks, keen eyesight and a carnivorous nature — they obtain their food by grasping with large talons. Eagles, owls, hawks and falcons all are raptors. “About 60 percent of the injuries we see are from car collisions, another 5 percent fall prey to toxins, and we see a lot of orphans in the springtime,” Kean says. Raptors also fall prey to animal attacks, and are vulnerable to things like wind turbines, and habitat loss associated with humans and their development. One of the center’s pioneers is biologist and eagle specialist, Al Harmata. He’s been studying raptors for more than 40 years and is a research affiliate at Montana State University in Bozeman. “[The center] has grown from a volunteer organization of a few people with good intentions into a professional organization known for its conservation and management of raptors,” Harmata says. He recalls the days when neither the state nor federal wildlife agencies had a place for injured raptors. “They often euthanized or ignored them, often due to a lack of funds. I don’t think that was a wise use of resources,” he says. Both Kean and Harmata talk about the raptors’ importance as indicator species. “They’re part of keeping our environment in a healthy balance, and we need to keep them out there,” Kean says. Kean started volunteering at the center in 2003 while studying for her bachelor’s degree in fish and wildlife management. She took one of only two staff positions ­— assistant director — in 2007, then became director a year later. “Becky has a difficult job but she has a great perspective and does well by the birds,” Harmata says. Assistant director Jordan Spyke is standing a few feet away from Kean, trying to defend the top of his head from a 4.5-ounce American kestrel named Watson. Like Kean, Spyke began here as a volunteer. Watson was found near Helena with an irreparable right wing fracture and an unfortunate case of imprinting that made him unreleasable. “Because he’s imprinted on humans he thinks I’m his mate,” Spyke says, donning a protective ball cap. “We give these birds a lot of freedom but they’re not pets.” Watson is one of 11 permanent raptor residents and part of the center’s educational outreach. With transport arranged for the injured burrowing owl, Kean is ready to manage daily medical care for various injured raptors waiting in the intensive and secondary care units in the next room: a turkey vulture that came in from Brackett Creek, just east of Bozeman, with a fractured femur, ruptured crop and road rash (diagnosis: car collision); a merlin just out of surgery to pin a broken humerus; a nestling great horned owl that fell out of its nest; a rough-legged hawk five weeks out of surgery; and one of the newest residents, a very sick bald eagle (potentially a poison victim). “Once through [the center’s] doors, raptors have a physical examination. We check their weight, do subcutaneous fluids for hydration, get blood samples for toxicity, do x-rays, and when needed consult with our veterinarian,” Kean says. Kean and Spyke monitor their patients through recovery, and even work on physical conditioning in the center’s flight barn (at 120 feet long it’s the largest in the state), before releasing them back into the wild. All in all, it’s just another day in the life of the Montana Raptor Conservation Center. Editor’s Note: For more information on volunteering, donating or helping Montana’s injured raptors, visit montanaraptor.org. 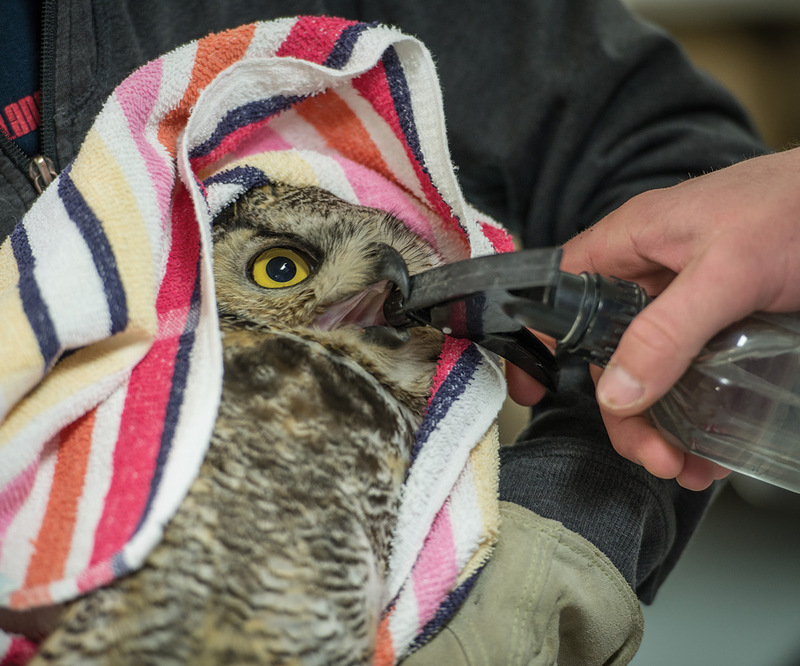 Jordan Spyke, assistant director at MRCC, gives an injured greathorned owl a drink of water from a spray bottle after cleaning its injuries. Spyke keeps a rough-legged hawk steady as Kean applies sutures to a wing injury at the Center’s operating table as Neka, an American Kestrel, looks on from its perch on the lamp. 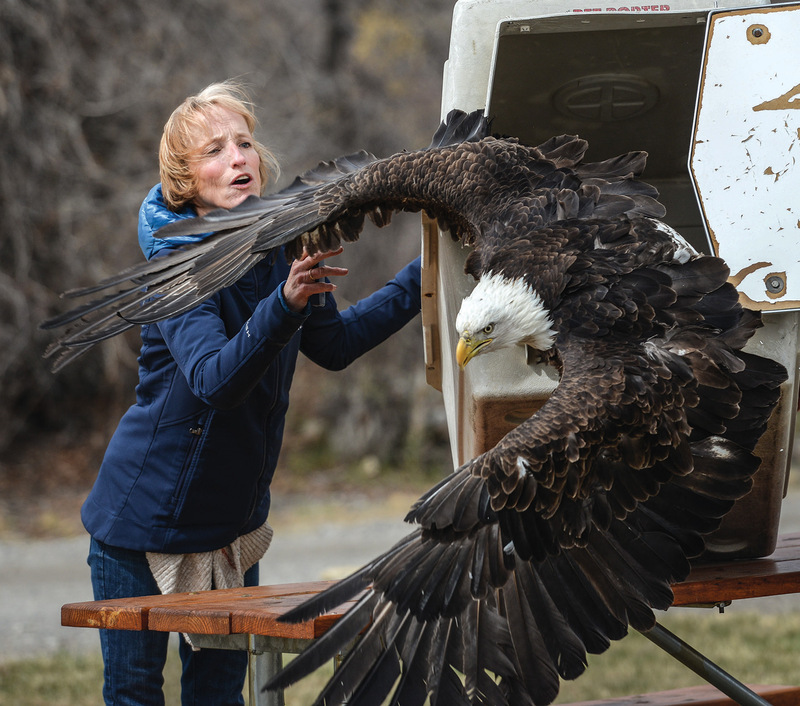 Bozeman resident Carol O’Neil helps release a bald eagle that was rehabilitated by the Montana Raptor Conservation Center after it was rescued from a leghold trap near Fort Belknap in March. 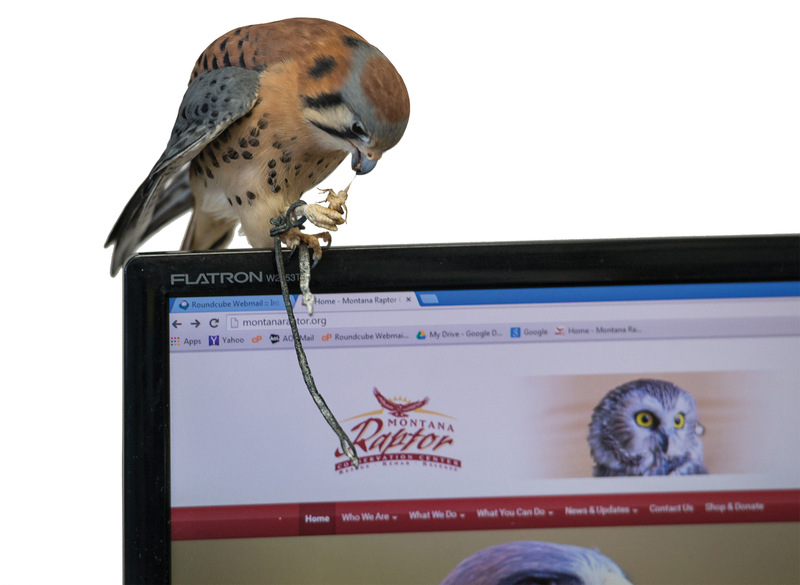 Watson, an adult male American Kestrel, eats a cricket atop a computer monitor open to the center’s webpage. Watson became an educational bird after imprinting on humans early in his life. 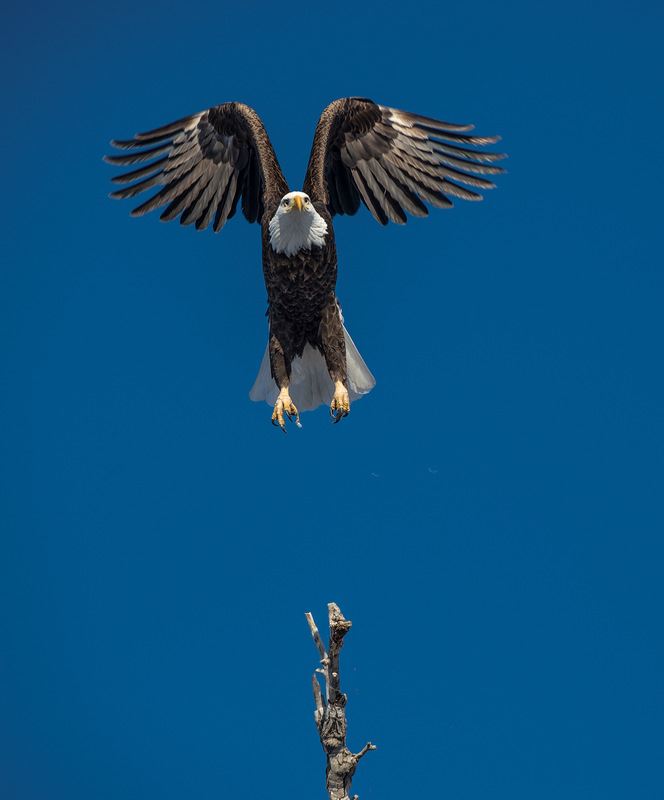 A bald eagle lifts off from a tree in southwest Montana. 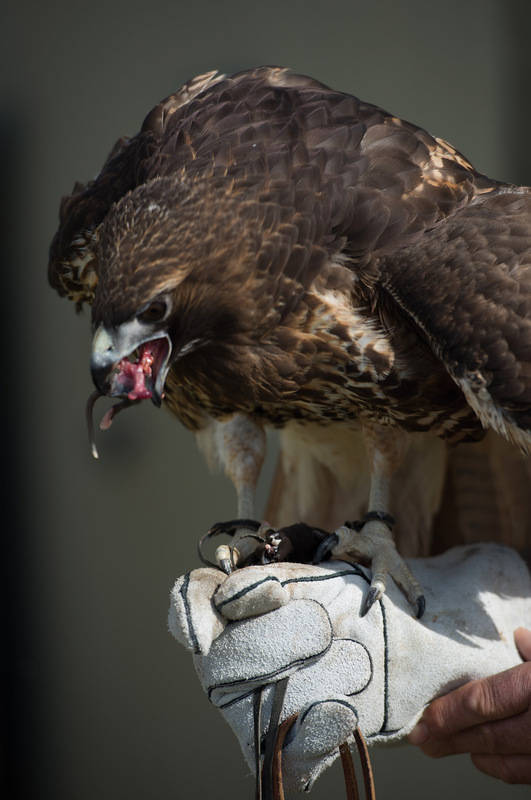 Sammy, an adult female Red-tailed Hawk, is one of the center’s educational birds. She was blown out of her nest as a nestling , orphaned and suffered a serious injury to her right eye. 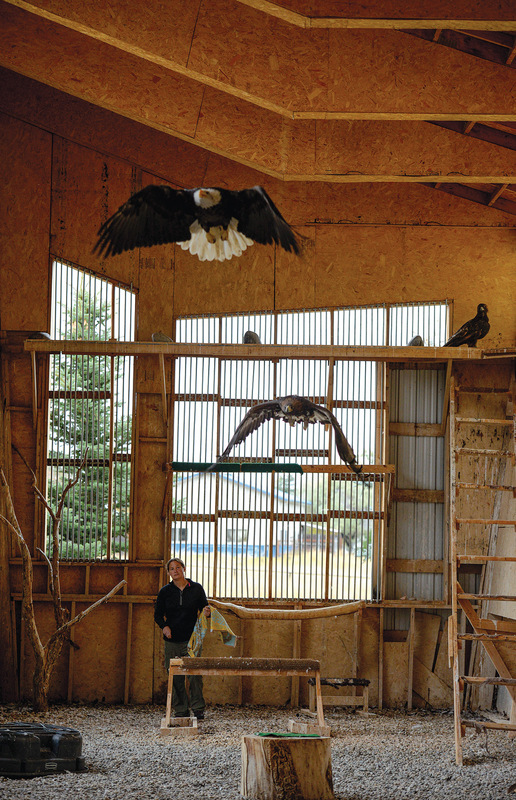 Montana Raptor Conservation Center executive director Becky Kean watches as eagles exercise their wings inside the flight barn. The barn is used to help rehabilitate birds and prepare them for release.